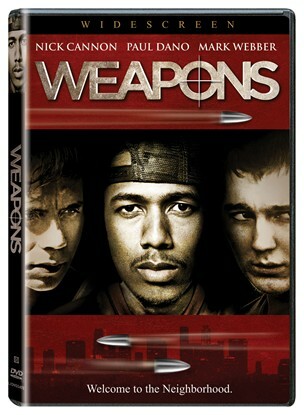 Up and coming superstars Nick Cannon (Drumline) and Paul Dano (There Will Be Blood) star in Lionsgate’s latest DVD release Weapons. An authentically depicted tale about a group of small town American teenagers who become enmeshed in a series of brutal, seemingly random, killings over the course of an intoxicated weekend, the film was nominated for the Grand Jury Prize at the 2007 Sundance Film Festival. Violent youth culture gets an explosive, provocative update with the raw and stylized Weapons. Reggie (Cannon) is a young, responsible African American man about to have his first job interview. When he spies a shiner on his little sister’s face, he becomes obsessed with finding a gun to exact revenge. Sean (Mark Webber, Broken Flowers) comes home from his first year in college to find that his old friends Chris (Dano) and Jason (Riley Smith, Radio) are still playing basketball, getting into fights, getting high, and trying to hook up with high school girls. One day, Sean notices that Chris has started to travel around town with a shotgun packed in the back of his truck. Weapons is an insightful study of teenage character and value systems in a world where everyone seems to have a gun, but the most dangerous weapon is the one unleashed by tender things broken inside innocent hearts.